Feel that rumbling in your stomach? 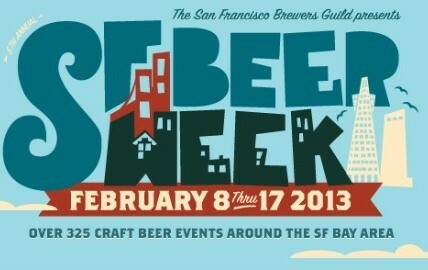 Why, that's your liver gearing up for SF Beer Week! This year, the annual, week-plus celebration of that holy union of hops, malt, grain, and yeast — which starts tonight in SF and runs through February 17 — is, as usual, kind of overwhelming, but never fear: I combed through the whole massive list and found the eight East Bay events to be most excited about. 13TH DOUBLE IPA FESTIVAL , Saturday, February 9 at The Bistro (1001 B Street, Hayward), 11 a.m.-6 p.m., $50: The OG event for anyone out there who's down with super-bitter, super-intense Double IPAs (hint: this should be everyone, because DIPAs are the best). If it's a little expensive, it's only because there will be more than 60 (!) beers on tap, several bands, CHEESE TASTINGS, and barbecue. More info here. BEER JUDGING 101, Sunday, February 10 at Pyramid Alehouse (901 Gilman St., Berkeley), 12 noon-4 p.m., $30: Learn how to actually sound like you know what you're talking about! According to the Beer Week website, this lecture/tasting, led by grand master professional beer judge (!!) David Teckam, and master-level judge Brian Cooper, will give you the chance to "sample and compare a number of world class beers, discussing ingredients, the brewing process, beer styles and the effects of aging on beer. Hone your natural ability to perceive and discuss various components in beer. Learn terms that judges use to describe beer. Expand your understanding of beer flavors, and learn about the Beer Judge Certification Program." No experience or background in beer required; two identical sessions from noon-1:30 and 2:30-4. Get tickets here. SPEAKEASY BREWING AND SCREAM SORBET: Wednesday, February 13 at Beer Revolution (464 3rd St., Oakland), 5 p.m.-10 p.m., free: If a better combination than ice cream and beer exists, I haven't found it. Get your Two Great Tastes on at Beer Rev, where Speakeasy and Scream will pair up to bring you various beery sorbets, as well as a bevy of brews on tap. BEER TRIVIA, Wednesday, February 13 at Bobby G's Pizzeria (2072 University Ave., Berkeley), 6 p.m.-11 p.m., free: An excellent way to put all that "research" to the test, featuring questions written by the folks at Anchor Brewing Company, plus a bunch of beers on tap and delicious, delicious pizza. No tickets or anything required, but get more info here. MIKKELLER: MEET THE BREWER, MEET THE LABEL ARTIST, Thursday, February 14 at The Trappist (460 8th St., Oakland), 7 p.m.-10 p.m., free: Legendary Danish gypsy brewery Mikkeller is roughly equally known for its hoppy, experimental. ever-changing roster of beers as it is for their adorable, line-drawn labels. Come meet the men behind both when excellently-named head brewer Mikkel Borg Bjergsø joins forces for label illustrator Keith Shore to talk shop, sign labels, and more. More info here. TOUR DE BIERE, Saturday, February 16 at Drake's Barrel House (1933 Davis St., San Leandro), 9:30 a.m.-6 p.m., $25: Tour four of the East Bay's biggest and best breweries — Drake's, Linden Street, Trumer Pils, and Pyramid — by bike, with various food and beer samples along the way. Most importantly, proceeds go toward the East Bay Bike Coalition, so you can feel totally virtuous about drinking at literally 9:30 a.m. This event is probably about to sell out, so scoot on over here quick to get tickets. 4TH ANNUAL CHOCOLATE AND BEER FESTIVAL, Saturday, February 16 at the Craneway Pavilion (1414 Harbor Way South, Richmond), noon-6 p.m., $15-$60: Remember what I said like two paragraphs ago about ice cream and beer? I take it back. Tickets to this event include live entertainment, a raffle, SAMPLES, a free shuttle from BART, and more; see here for more info and to buy tickets. I wish you and your aforementioned liver the best of luck.